I haven't written nearly enough about Glyos. The brainchild of Matt Doughty and family, a man who created his own toy company from scratch, in his attic, and then shared it with the world. 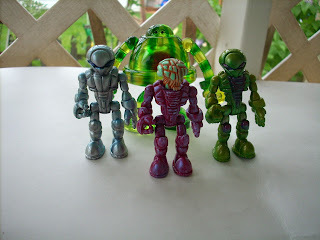 Matt developed Lego-like joints that can be popped apart and reassembled, and each figure can be dismantled, and combined with a growing number of toys that use the Glyos Joint System. Customization is highly encouraged. One frequent Glyos collaborator is Marty Hansen, owner and mastermind of TGB Toys, and resin casting guru. Seen above is a Glyos figure, with a head sculpted by Matt, and cast by Marty. There's just a bit of pearl and glosscoat on the head, then a wash to bring up the contrast. It's incredibly beautiful translucent resin, with almost no mold lines. Also the sculpt reminds me of The Brain from Planet Arous. Another terror from childhood. The figure itself is built-up from a variety of Glyos parts, in the Bulker-Suit configuration. The paint is, as always, Monster Kolor, Sublimed Green metallic over an olive green base. The arm was clear plastic, painted with MK C-thru colors. It's all finished with MK ultragloss clearcoat, and a bit of gold pearl. Then I darkened the panel lines with olive green acrylic, and did a bit of wash on the head to bring up the contrast. One of the niftier things about a Glyos and Monster Kolor combination, is that even after customization, they can still be posed and fussed with. This flu is pushing week three, it's been brutal. I have dozens of projects I want to be working on, but putting on my mask and heading outside is still beyond my abilities. In the meantime, enjoy this picture of my cat Maggie, making a cradle in my photo booth. I'm still fighting off the flu, apologies in advance if this post is less-than-lucid. One more Max Toy Co Mini figure, this time in clear vinyl! Xam is the alien baddie in Mark Nagata's Max Toy universe. Like Captain Max, his figure is on the small side, almost micro-scale. A nifty sculpt, and a cool design, somewhere between the Metaluna Mutant and Doctor Zoidberg. I like it. Monster Kolor C-thru on the job again, to preserve the transparency. Obviously, I like playing with opacity, and first I sprayed the eye, feet, and claws with Monster Kolor silver, my go-to primer and base coat. I put it on thick, and faded into the transparency. I masked off the eye with silly-putty, and went to work with the C-thru paints. First Seashore stripes for a blue ringed octopus look, and contrasting yellow to fill the gaps. Then the silly putty mask came off, and I highlighted the unblemished silver with Moon Dust. It's a very fine silver pearl coat with a subtle shimmer. It makes the silver really pop. For your own Alien Xam, check the Max Toy Co Store. Still have the flu, and it's abominable. Fever, chills, aches, repertory distress, completely messed up sleep. I haven't been this functionally impaired since I had a herniated disk four years ago. In lie of a better writeup, enjoy the above image of some of my Glyos customs. 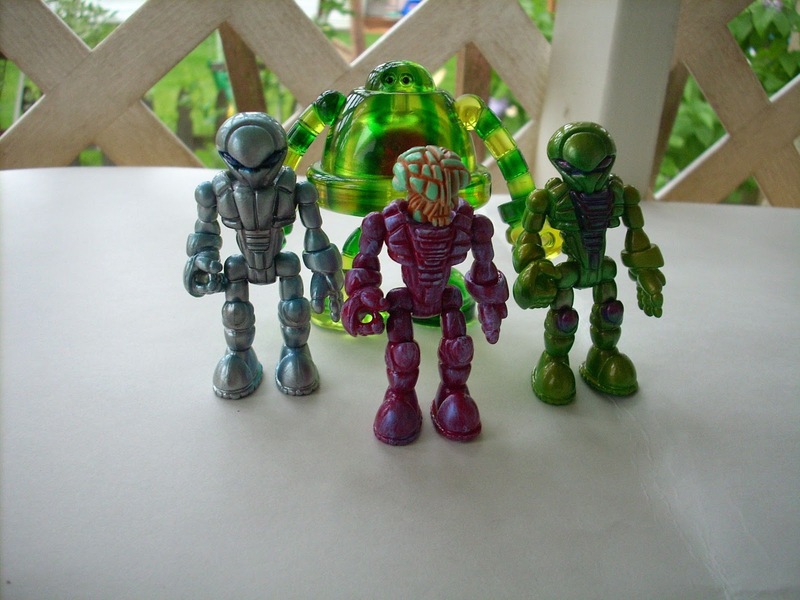 Glyos are awesome, you guys, go buy a few.